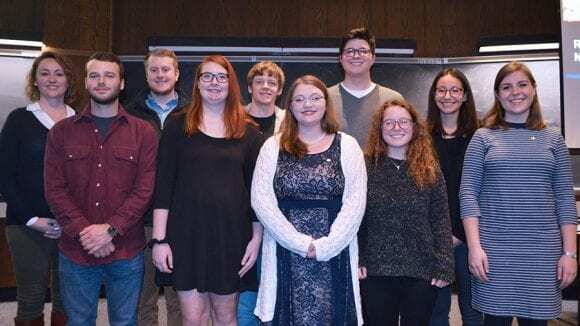 Fall 2018 inductees into the Gamma Theta Upsilon honor society in geography, Alpha Tau Chapter (left to right): Meg Wieger, Hunter Mitchell, Garrett McKinney, Katie Giesa,Thomas Loughery, Brittany Waltemate (Treasurer), Bryce Buck, Erin Arndt (Secretary), Milan Liu (Vice President), Hope Bodenshatz (President). Inductees not pictured: Marianne Black, Emily Case, Cameron Franz, Joseph Grosso, Tracy Severcool. Sarah Chamberlain, Rob Brooks, Denice Wardrop, Mike Nassry, and Peter Backhaus planned and participated in a joint meeting of wetland scientists and managers from 13 northeastern states and a tribe in Cooperstown, NY this month. First-year student Hannah Perrelli is a co-author of the poster “Biomimetic Materials for Regenerative Bone Tissue,” which won the Outstanding Research Potential Award in the 2018 EMS undergraduate poster exhibition. Courtney Jackson was selected as an Alfred P. Sloan Foundation Minority Ph.D. program scholar. Welcome Kaitlyn Zigmond who is the work-study for the department for the remainder of fall 2018 and for spring 2019. Thanks for joining us for the fall 2018 semester of Coffee Hour. Please join us on January 18, 2019 for the spring semester opening Coffee Hour featuring Lilian Pintea. The Pennsylvania State University Libraries invites applications for the position Open Source Geospatial Analyst within the Digital Scholarship and Data Services department. The Open Source Geospatial Analyst will work as a member of the Donald W. Hamer Center for Maps and Geospatial Information team to support open source software, open data, and web-mapping solutions to spatial problems in research, teaching and learning at Penn State University. S/he will provide expert guidance through one-on-one and small group consultation services, develop and deliver guest lectures and workshops, and will be active in the community of geospatial scholars and professionals at the university. After growing up in a military family and serving in the armed forces as a young adult, Colin Kelly has lived all over the world — 16 different locations in fact — and has seen many amazing places. But when he visited Peru for the first time, he found himself fascinated with the landscape, people and the connection between them. We argue that the North American Model of Wildlife Conservation (NAM) as currently promoted is an overly narrow construct, used both to explain how North American wildlife conservation developed historically, and as a prescriptive framework for applying a hunting-focused form of wildlife conservation. We argue both constructs are problematic in that the complexities of traditional and historical roots of wildlife conservation in North America are portrayed inadequately and selectively to overemphasize hunter’s contributions. We raise issues and concerns about the rhetoric used to promote NAM and its associated form of wildlife conservation both within the wildlife profession and to the public. Portrayals of NAM have repeatedly emphasized the important role of hunters and hunting, largely failing to provide attribution for contributions made by other stakeholders or through other forms of interest in wildlife. The North American Model of Wildlife Conservation does capture some of the traditional policies and practices within wildlife management in the United States of America (USA), and to some extent Canada, but in our opinion, it has not evolved to fully represent wildlife conservation efforts of the past, nor point the way toward broader, more inclusive approaches to conserve species, communities, and ecosystems into the future. We offer 5 premises with evidence to support our assertions and probing questions as a basis for initiating a call to critically analyze NAM’s structures, functions, and purposes. Briefly, the premises focus on NAM as a hunter/hunting-focused form of wildlife conservation that serves to empower hunters and marginalize non-hunting wildlife conservationists in decision making pertaining to wildlife policy, ultimately hindering development of a more holistic, progressive form of wildlife conservation. Although landscape indicators are widely used to assess wetland ecological condition, how they capture the spatial arrangement of land cover is not well addressed. We conducted a Level 1 Landscape Assessment to revise strengths and weaknesses of landscape indicators when links to ecological conditions are strong. Wetland sites mapped by the National Wetlands Inventory were defined as 1-km radius circles around centroid points. Forest fragmentation type, road density, Landscape Development Intensity (LDI) index, and percentage of impervious surface were quantified at each site by integrating land cover and road network information. Based on forest cover, 6% of wetland sites scored in the highest ecological category while 45% fit into the lowest one. Results showed high dispersion of data for the impervious surface indicator in the lowest condition category. When comparing LDI and impervious surface under different landscape compositions and configurations, LDI better described distur- bance in agricultural areas where road density was low. Impervious surface better reflected the occurrence of fragmented landscapes at forested areas with high percentage of edge forest cover. In addition, a significant proportion of freshwater wetlands (60%) in the lowest condition category was associated with first-order streams, indicating a wide range of disturbance at some headwater watersheds.